Lodgical Solution has grown a lot over the years. As we’ve worked with properties of all types and sizes across North America, we’ve added more custom options, supplementary functions and additional reports. All those new features have been essential. But as we’ve added more to the software, we realize it’s gotten a bit cluttered. This year, we decided to take a step back and re-evaluate our approach. Over the past few months, we visited many properties and talked with managers and staff members from all facets of your operations. We listened to you: We heard what your stress points are, when common tasks take longer than they should, and where things could be simpler. We’re proud to release the result: Lodgical Solution Enterprise version 11. It’s Lodgical Solution, completely redesigned from the ground up. We love how it turned out. We hope you will, too. For a while now, you’ve been able to access housekeeping information and all your reports from any device, thanks to the Lodgical Solution web application. With this release, we’re expanding that idea to include the new Home and Analytics screens. Both these screens – as well as the Housekeeping screen – are now directly integrated into Lodgical Solution Enterprise. They’re also available through our application on any computer, phone or tablet. So you’ll have a similar user experience whether you’re sitting at your front desk computer or checking up on the office remotely via your phone. 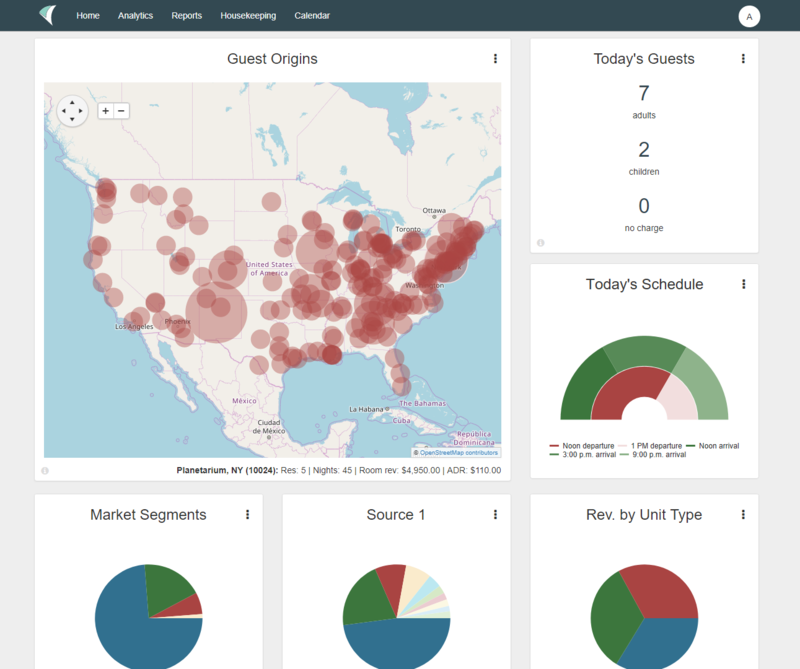 In this release, we’re introducing two beautiful new screens that we think you’ll love: Home and Analytics. The Home screen, designed especially for front desk workers, features key, often-used information about your property, such as emergency contacts, upcoming events and the weather forecast. On the Analytics screen, we’ve taken a graphical, dashboard-style approach to showing you data about your property’s status and performance. 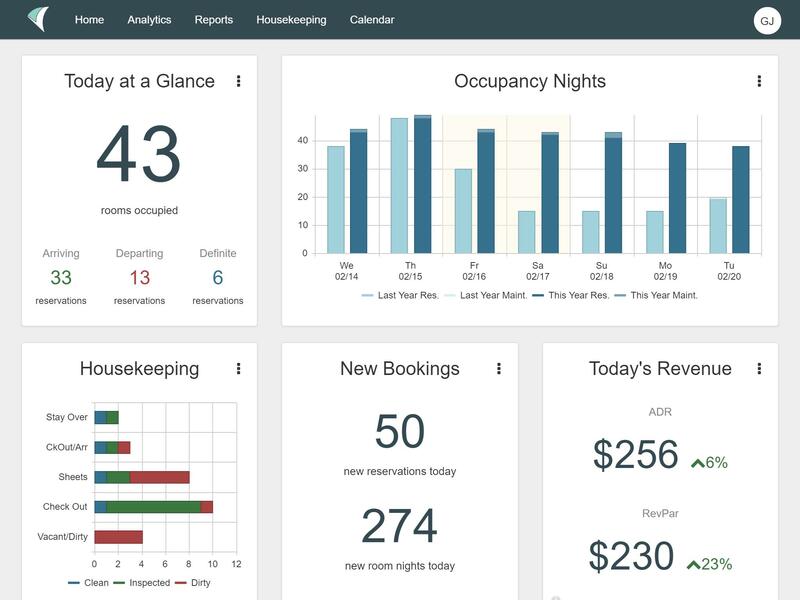 You can now see breakdowns of your occupancy and revenue – and comparisons to how you were doing this time last year – all on one screen. No more digging into 10 different reports to find the information you need. We’ve combed through our entire program to make Lodgical Solution smarter, and made improvements to the design where our system was slowing you down. One of the first things you’ll notice when you open the new Lodgical Solution is the tabbed interface. 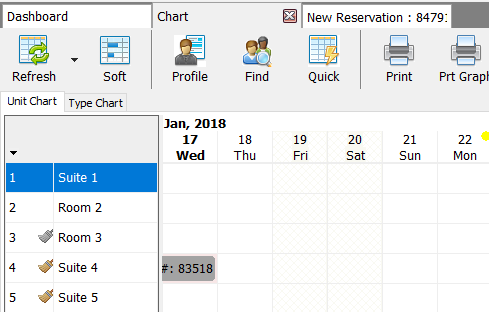 Rather than opening each reservation or chart in a new window, which could get difficult to keep track of, we open them in tabs. You can now see everything you have open from one window. And regardless of which tab you’re on, the buttons and information you use the most — Add Reservation, Reports, Chart, and the guest lists — are always present. That means fewer clicks (and fewer headaches) for you, and a smoother experience for your guests. One of the biggest improvements we made with this release was the complete reorganization of Lodgical Solution’s menus. As we added more functions over the years, our menus got bloated, which made it difficult to find what you were looking for. Now, they’re simple and intuitive. Functions related to a common activity — such as Accounts, Housekeeping or Maintenance — are grouped together. More commonly used functions are placed at the top. And for longer menus, items are alphabetized, so you can quickly find what you’re looking for. Similarly, we’ve reorganized the tabs of the reservation screen to consolidate fields into fewer tabs and group them in ways that are more intuitive. So you can spend less time doing data entry, and more time taking care of your guests. If you'd like to update to Version 11, or if you're interested in a demo of Lodgical Solution, please call our office any time at 920.746.0606. Lodgical Solution Enterprise now supports selling lock-off units on web-booking engines. This new setting must be set up in Lodgical’s GDS-interface. Lodgical Solution has always been great for condo hotels. The Owner Portal will make the Lodgical experience even better for those properties. Forgot to change an arrival date? Or have a no-show? With this new setting, you can change the arrival date within 24 hours after the original arrival date. Report Explorer in Lodgical Solution Enterprise decreases the run time to load reports, which makes for a smoother, more efficient day. 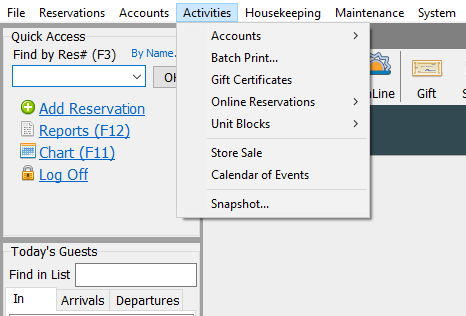 A new feature has been added to Lodgical Enterprise which enables you to assign rooms to accounts once you make the reservation block. The Lodgical Solution housekeeping app offers your staff the data they need at their fingertips, and an upgrade to your operations. Here's how to use it. Lodgical POS is touch-screen software with mobile capabilities. It features secure credit card processing and inventory management for your sales needs. eRegistration provides paperless registration for your guests, saving you time and keeping your property green with less paper consumption. The signature pad can display a slide show when it is not in use.